It’s my favourite time of year, Summer time. This year in the UK we’ve had a fabulous Summer with a long lasting heat wave, perfect for BBQ parties and spontaneous drinking games in your siblings back garden, as well as being able to leave the house without even taking a jacket! The sun has been kind to us, but it hasn’t been so kind to those of us with sensitive skin. I’m a massive advocate for wearing sun lotion, and protecting your skin from the sun – which you’ll hear more on later, but I also don’t think that just because the sun is out and giving you some Vitamin D you should neglect your skin care routine and forget to wind down of an evening. Come 5pm and I’m home from work, the first thing that I do is grab my serums, lotions and creams and take care of my skin that has been exposed to the world all day. This not only cosies me up and makes me feel good, but also gets me feeling ready for the night ahead, whether I’m going to be sleeping it away or staying up finishing a draft that was meant to go out tomorrow morning. 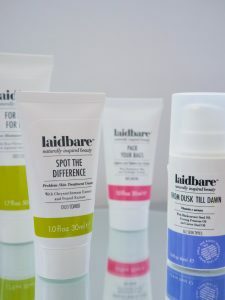 Laidbare were kind enough to send me some goodies a few weeks ago, and I’ve been exclusively using these products to get the most out of my skincare routine, everything that I was sent is stuff that I need and would use on a day to day basis regardless, and let me tell you, this stuff is incredible. The first thing that I noticed using these products is that they all share a similar citrusy smell, it’s really summery and delicious, I spent five mins just smelling the products on the back of my hand because they’re just that fresh. The pore cream, “For Richer For Porer,” has an exfoliator texture despite not being an exfoliator and is designed to masque imperfections and reduce pores, it’s also my favourite out of the four products that I have, I love the feeling of it on my face and the smell lasts for ages even after it’s been washed off. My face feels smooth, fresh and looks glowy after I use it. The tube says it’s for weekly use, so I’d definitely limit this to a weekend use when you fancy having a pamper sesh, it really does the job is claims to do and feels fantastic. The “From Dusk Til Dawn” vitamin c serum is unlike any serum that I’ve used before, it has a pump in a bottle rather than a pipette like ones that I’ve tried before, it also comes out a lot more watery but this isn’t a bad thing, one pump goes a long way, in fact, enough to cover my entire face (and both hands and arms when I first tested it), and I just love the citrusy scent. It definitely sits on your face for a while too, it feels so smooth on the skin and it’s incredibly gentle. I’ve spoken a lot over the years about my pesky acne prone skin, so I was excited to try out the “Spot The Difference” problem skin treatment cream. You can apply this all over your face or just on the problem zones, it’s very moisturising and doesn’t strip your skin of essential oils and hydration. 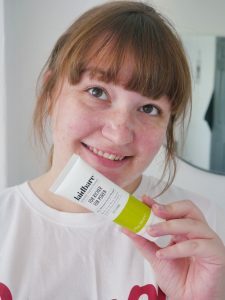 After trying it for a few days I did notice a difference in my skin, especially on my chin which is where I tend to break out the most, it seemed to be more tamed and less irritated, which I can definitely give two thumbs up to! I’d definitely apply this all over my face on my worst days, but right now my skin isn’t actually doing too bad so I’ll definitely keep it to my problem zones. Finally, a product that I definitely have been needing these past few weeks is a tube of the “Pack Your Bags” eye cream. The cream is designed to lighten and tighten your eye bags and hide your sleepy eyes. I’ve been a bit poorly these past few weeks with a cold and hay fever, so I’ve had a very tired looking face. You can tell in the photos that my eye bags were definitely tamed. The dark circles seemed to vanish and my natural crease is less prominent when my face is resting, it makes me appear more awake and fresh faced which is every girls goal. This is an anti-ageing cream too, and I read a while ago that to use anti-ageing creams in your twenties is the best time to start, so there is absolutely no shame in my game! These products have all been an absolute joy to use, and a little goes a long way with each product as well, and I’m totally here for the colour co-ordinated and bright packaging. 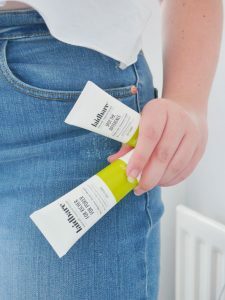 These products will definitely be coming away with me on my holidays (especially for that tasty citrusy scent), and Laidbare will definitely be a regular in my skin care routine. 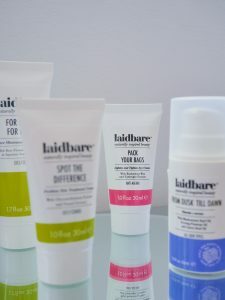 If you fancy trying these products out for yourself, have a look on the Laidbare website – it’s worth your time! These products are all crazy affordable, cruelty free, eco sensitive and natural. 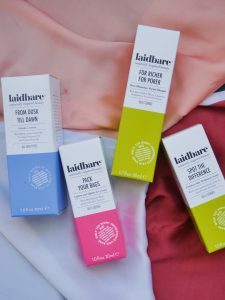 *Thank you to Laid Bare for sending me the products to review in this article!